My free emergency medicine book online: Emergency Medicine and First Aid. A free ebook online. (This is my own channel ! It contains cardiology cases. It is under development -more videos are being continuously added). This is an obstruction of a branch of the pulmonary artery by thrombus originating in the systemic venous system (most commonly in the lower extremity or deep pelvic veins). The thrombus travels through the venous system into the right heart chambers and from there it lodges in the pulmonary artery. Chest pain of sudden onset, accompanied by dyspnea, cough, and in some cases hemoptysis, developing in a patient who has been immobilized or bedridden or has a recent history of surgery, pelvic or lower extremity injury or cancer is suggestive of pulmonary embolism. In patients with acute pulmonary embolism, the most common symptom is dyspnea of sudden onset, followed by chest pain. In patients with acute pulmonary embolism, the most common symptom is dyspnea of sudden onset. Depending on the severity of the pulmonary embolism and the patient's condition, dyspnea (shortness of breath) may be prominent at rest or it may be minimal at rest but worsening during activity. Chest pain (often -but not always-pleuritic) and cough are also common. Low-grade fever occurs in some patients. Hemoptysis also occurs in some cases. In a massive pulmonary embolism, there is severe dyspnea, cyanosis, or syncope and the patient commonly is hypotensive. The most common clinical findings are tachypnea and tachycardia. regurgitation) or of elevated pulmonary arterial pressure (an accentuated pulmonic component of the second heart sound-P2). These patients also have an increased risk of early mortality, although the risk is less than in a massive pulmonary embolism. An acute pulmonary embolism with normal systemic blood pressure and no evidence of right ventricular dysfunction when managed with standard therapeutic anticoagulation, generally will demonstrate a benign hospital course. Pulse oxymetry and arterial blood gases: A low arterial oxygen saturation, either from pulse oximetry or arterial blood gases in the absence of an adequate explanation ( e.g. acute left sided heart failure, chronic obstuctive pulmonary disease or pneumonia) should raise suspicion for pulmonary embolism. A normal oxygen saturation cannot exclude pulmonary embolism. sions in the precordial leads, especially the right ones) or the classic, but less common, S1Q3T3 pattern (deep S wave in lead I, Q wave in lead III, and T-wave inversion in lead III ). The chest X-ray in pulmonary embolism in many cases does not demonstrate significant findings, in some cases it shows nonspecific findings such as atelectasis, an elevated hemidiaphragm, or a pleural effusion, and in some patients it demonstrates classical signs of pulmonary embolism such as the Westermark's sign or a pleural-based wedge-shaped consolidation. In patients with a moderate or high index of clinical suspicion CT pulmonary angiography or a ventilation perfusion scan ( V/Q) scan will establish the diagnosis or exclude it. Note that in many cases a V/Q scan can provide diagnosis, but it has the disadvantage of a high number of indeterminant studies, where subsequent imaging (usually CT -pulmonary angiography) will be required. The most accurate test is pulmonary angiography, but it is an invasive test. In patients with a low probability of pulmonary embolism a negative sensitive D-Dimers test excludes the diagnosis of pulmonary embolism, whereas if the test is positive, a CT pulmonary angiography ( or a V/Q scan) will be required. The reason for this is that elevated D-dimers are sensitive but have a low specificity. A patient complaining of chest pain, worse with deep respiration, cough, and mild dyspnea. Recent surgery for a femoral fracture. What are the findings in this chest X ray? In the lower right lung, there is a wedge-shaped consolidation with its base against the pleural surface. 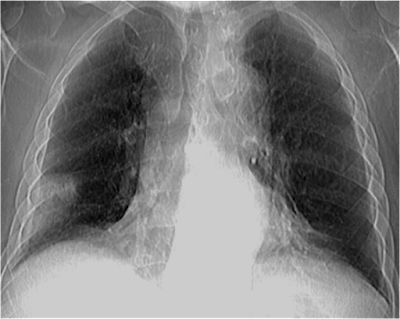 This radiographic sign and also the patient's history is highly suggestive of a pulmonary embolism. every 12 hours (e.g. enoxaparin) or 200 U/kg once per day. Another choice of LMWH is tinzaparin 175 U /Kg SC x 1 time/day. Unfractionated heparin 17,500 U SC x 2 times/day ( 17,500 U SC every 12 hours). The dose is adjusted to achieve the above target aPTT. A vitamin K antagonist (VKA), warfarin or acenocoumarol can be started on the first or second day of treatment and must be overlapped with heparin for 4-5 days, and until target international normalized ratio (INR) 2 - 3 is reached. Then the parenteral anticoagulant is discontinued and treatment continuous only with the VKA. When a VKA is started in an acute thrombotic state, there is a decline of antithrombotic proteins C and S before the decline in coagulation factors. This causes a transient increase in thrombogenic potential, until the anticoagulant effect of the VKA starts to develop. The concomitant administration of heparin (unfractionated or LMWH) during the first 5 days of treatment counteracts this transient procoagulant effect. For the chronic anticoagulant treatment of patients with pulmonary embolism (usually for 3-6 months) instead of a VKA, one of the newer PO anticoagulants (NOACs= non-vitamin K antagonist oral anticoagulants) can be given. In fact NOACs (dabigatran, rivaroxaban, apixaban, edoxaban are preferred over VKAs. Oral apixaban, a factor Xa inhibitor, 10 mg x2/day for a week, followed by 5 mg x2/day). Thrombolytic therapy in pulmonary embolism is indicated only in massive pulmonary embolism with hypotension or a pulmonary embolism with severe compromise in oxygenation (when there is a deterioration in the clinical course despite anticoagulation), in the absence of contraindications to thrombolysis. Thrombolysis provides rapid resolution of thrombus. A possible complication of thrombolytics is major bleeding ( the incidence of intracranial hemorrhage is up to 3%). The usual option for thrombolysis in a massive pulmonary embolism is alteplase (t-PA= tissue plasminogen activator) 100 mg IV infusion over 2 hours. (Other choices include streptokinase and urokinase). Thrombolysis is also indicated in extensive iliofemoral deep venous thrombosis. In submassive pulmonary embolism, thrombolysis is controversial because it has not been proven to offer a decrease in mortality in such cases. Relative contraindications: organ biopsy, large-vessel puncture, cardiopulmonary resuscitation, within 10 days postpartum. In patients with a massive pulmonary embolism, when thrombolysis is contraindicated, an alternative treatment is surgical or catheter embolectomy. The placement of a filter in the inferior vena cava (IVC filter) is indicated in patients with pulmonary embolism who have a contraindication to anticoagulation, or when pulmonary embolism or deep venous thrombosis recurs despite treatment with therapeutic anticoagulation. The usual duration of anticoagulation for pulmonary embolism or deep venous thrombosis is 3-6 months (most authorities generally recommend 6 months) but in cases of pulmonary embolism without a transient (reversible) predisposing factor, anticoagulation should be continued for a longer time interval, probably indefinitely. For the long-term treatment for pulmonary embolism not associated with malignancy a vitamin K antagonist (warfarin or acenocoumarol) or a NOAC (e.g. rivaroxaban) is used, but generally, for the long-term treatment of pulmonary embolism associated with malignancy, a LMWH is the recommended choice. Generally, cyanosis is defined as a bluish discoloration of the skin and mucous membranes as a result of the increased content of deoxygenated (reduced) hemoglobin in the blood. Cyanosis can be due to a reduced oxygen saturation (desaturation) of arterial blood or increased extraction of oxygen from the blood. Both mechanisms lead to an increased concentration of reduced hemoglobin. In general, desaturation of arterial blood can be the result of decreased oxygenation of blood due to a pulmonary disease reducing the ability of the lungs to effectively oxygenate blood or a central nervous system disease causing a reduction in ventilation. However, desaturation of arterial blood can also result from situations where mixing of oxygenated and deoxygenated blood occurs. This is the mechanism responsible for cyanosis in cyanotic congenital heart disease. Cyanotic congenital heart disease is characterized by a right to left shunt causing deoxygenated blood to enter the oxygenated limb of the circulatory system. In other words, systemic venous blood gets shunted into the left side of the heart or into the aorta, bypassing the pulmonary circulation. The result is systemic arterial desaturation, i.e., a lower than normal oxygen saturation of the arterial blood causing cyanosis. Tetralogy of Fallot (TOF) is the most common cyanotic congenital heart disease. The second most common is dextro-transposition of the great arteries (d-TGA). Tetralogy of Fallot (TOF) accounts for approximately 10% of all complex congenital heart disease and it is usually diagnosed during infancy. A nonrestrictive (large) ventricular septal defect (VSD) located in the membranous septum in the subaortic region. The clinical manifestations (signs and symptoms) depend on the severity of the narrowing (obstruction) of the right ventricular outflow tract (RVOT) because this determines the degree of right to left shunting and the severity of cyanosis. In other words, the ratio of flows to the pulmonary and the systemic circulation (Qp/Qs) depends on the ratio of the resistance caused by the RVOTstenosis to the systemic vascular resistance (the resistance of the systemic circulation). In the usual form of TOF the RVOT stenosis is severe enough to cause cyanosis. However, there is also an acyanotic form of TOF, where the stenosis is mild and so the shunt is left to right and the clinical picture resembles that of a large ventricular septal defect (VSD). In infancy, signs and symptoms include tachypnea, dyspnea (during feeding or crying), and cyanosis. Infants and children with |TOF also demonstrate poor somatic growth. Cyanosis is caused by right-to-left shunting through the VSD. This occurs because the obstruction (stenosis) of the RVOT results in an increased right ventricular pressure which favors shunting of blood from the right to the left ventricle. Tetralogy spells "Tet spells" or hypoxic spells are common. These are episodes of increased cyanosis that usually occur in events that suddenly decrease the systemic vascular resistance (SVR) such as increased physical activity, crying, defecation, or when the infant or child is in agitation, or in hypovolemia which increases RVOT stenosis. The decrease in SVR causes an increase of the right-to-left shunt. Hypoxic spells are characterized by tachypnea, hyperpnea, a decrease in the intensity of the heart murmur, and increased cyanosis. In some cases, this can be followed by loss of consciousness, seizure, and even a cerebrovascular accident or death. Older children with hypoxic spells usually have learned to find a relief in squatting. This position increases systemic vascular resistance, thus increasing left ventricular pressure and decreasing right to left shunting of blood, leading to decreased hypoxemia. Untreated adults with TOF manifest dyspnea, cyanosis, and decreased exercise tolerance or dyspnea on exertion. Cyanosis results in secondary erythrocytosis, hyperviscosity, abnormal hemostasis and predisposes to stroke. Other complications that can occur in patients with TOF are infective endocarditis and aortic regurgitation. Physical examination in TOF shows cyanosis, often with clubbing of the fingers. Auscultation reveals a harsh systolic ejection murmur at the left mid and upper sternal border due to the pulmonary stenosis. The VSD produces no murmur because it is large and does not have a pressure gradient. In TOF the second heart sound (S2) is usually single because the pulmonary component is markedly reduced (due to the reduced pulmonary arterial pressure as a result of the RVOT stenosis). A prominent right ventricular impulse along the left sternal border and a systolic thrill at the upper and mid left sternal border may be present. In TOF, the ECG shows right ventricular hypertrophy with right QRS axis deviation and may also demonstrate right atrial hypertrophy. These findings are consequences of the RVOT obstruction. After surgical correction, a right bundle branch block (RBBB) appears on the ECG. When the QRS is markedly prolonged (> 180 ms) there is an increased risk of ventricular tachycardia and sudden cardiac death. Chest X-ray shows a concave main pulmonary artery segment (because the RVOT obstruction results in a small pulmonary artery) and an upturned apex (due to right ventricular hypertrophy). This results in a boot-shaped heart (coeur en sabot) with diminished pulmonary vascular markings. A right aortic arch is present in 25% of the cases. Echocardiography in TOF shows a large perimembranous VSD, an overriding aorta, the presence and the degree of RVOT obstruction and right ventricular hypertrophy. 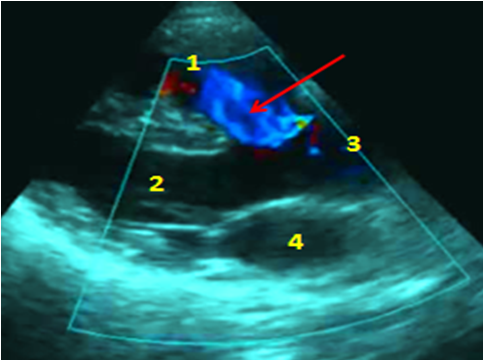 Parasternal long axis echocardiographic view of a patient with cyanosis due to tetralogy of Fallot. Parasternal long axis echocardiographic view with color Doppler of a patient with cyanosis due to tetralogy of Fallot. Neonates with severe cyanosis usually are treated with an IV infusion of prostaglandin E1 (0.01 to 0.1 mcg/kg/min ) to open the ductus arteriosus. This causes an increase in pulmonary blood flow. For hypoxic spells the infant is held in a knee-chest position and oxygen is usually administered, although it has a small effect. Morphine sulfate 0.1-0.2 mg/kg subcutaneously or intramuscularly can be administered to reduce hyperpnea. Intravenous propranolol 0.05 mg/kg also has a beneficial effect because it stabilizes peripheral vascular reactivity, and thus it prevents a sudden reduction of the SVR. To prevent hypoxic spells oral propranolol 2-4 mg/kg/day can be used. Complete surgical repair of TOF generally is undertaken at the age of 4 to 12 months. Complete surgical repair, when feasible (when there is a favorable anatomy of the RVOT) generally is the treatment of choice. The ventricular septal defect (VSD) is closed with a patch, and the right ventricular outflow tract (RVOT) obstruction is relieved by resecting the obstructing hypertrophied infundibular muscle, when necessary with the additional placement of a patch at the main pulmonary artery or the pulmonic annulus and by repairing the pulmonic valve. Surgical mortality rate is 2-3%. After total repair of TOF the 25-year survival rate is 94%. Shunt procedures may be needed in cases of pulmonary atresia, hypoplastic pulmonary annulus, hypoplastic pulmonary arteries and in infants < 3 months with severe cyanosis. The Gore-Tex shunt or modified Blalock Taussig shunt is the connection of these two arteries with a tube (graft). This is the shunt procedure usually employed. Instead of a shunt procedure, an alternative procedure to increase blood flow to the lungs is balloon dilatation of the RVOT and pulmonary arteries with or without stenting. Most patients that have undergone a shunt procedure or balloon dilatation of the RVOT, will later need complete surgical repair unless they have developed irreversible pulmonary hypertension. After surgical repair, patients need regular follow up every 6-12 months. Pulmonary regurgitation (PR) can occur following transannular patch repair. Other possible complications include distal pulmonary artery stenosis or rarely pulmonary arterial hypertension (PAH). When chronic severe pulmonary regurgitation develops it results in right ventricular (RV) dilatation and dysfunction. Severe PR may warrant intervention when it is associated with substantial RV dilation, right ventricular EF < 45%, or exercise intolerance. Severe PR is treated with surgical or percutaneous replacement of the pulmonary valve. Residual stenosis may occur either at the RVOT or at the pulmonary valve. Intervention is required if the RV systolic pressure is ≥ 2/3 of the arterial systolic pressure. Another possible complication of surgically corrected TOF is the development of an RVOT aneurysm. Some patients have a residual VSD. If it is large, it can lead to left ventricular (LV) volume overload. The cause is either incomplete closure at the time of surgery or partial dehiscence of the patch. A residual VSD with a shunt > 1.5 : 1 will probably need surgical intervention. Aortic root dilatation with aortic regurgitation (AR) is another possible complication of TOF. Surgical treatment will be needed if there is severe symptomatic AR, or severe AR with progressive left ventricular dilatation, or an aortic root diameter ≥ 5.5 cm. Left ventricular (LV) dysfunction can occur as a result of LV volume overload. It may be due to a delayed repair of the tetralogy, a longstanding palliative shunt, a residual VSD, or severe aortic regurgitation. Patients with corrected TOF may develop arrhythmias, such as atrial fibrillation or ventricular tachycardia (VT). The development of arrhythmias is often a sequela of hemodynamic deterioration. Endocarditis may complicate TOF, although it rarely occurs. Transposition of the great arteries (TGA) is defined by a discordant ventriculoarterial connection, i.e. the great arteries arise from the wrong ventricle. In the complete (d-) transposition the aorta originates from the right ventricle with a position in front and to the right of the pulmonary artery and the pulmonary artery arises from the left ventricle. This results in two parallel circulations in contrast to the normal anatomy and physiology, where the systemic and pulmonary circulation are in series. In d-TGA, the desaturated systemic venous blood enters the right atrium, then through the tricuspid valve the right ventricle and then the aorta, and flows into the arterial system. Thus unoxygenated blood enters the systemic arteries. It passes through the capillaries of the tissues and then it returns through the venous system to the right atrium. In the other circuit, the oxygenated pulmonary venous blood passes through the left atrium, the mitral valve and the left ventricle to the pulmonary artery. Through the pulmonary artery it enters the pulmonary circulation and then back to the pulmonary veins and to the left atrium. These two parallel circulations would not permit the flow of oxygenated blood through the systemic arteries to the tissues without the presence of a communication between the two circulations. Thus, for life to be possible, some communication between the two circulations must exist after birth. In many patients, the only communication between the two parallel circulations, which allows mixing of oxygenated and unoxygenated blood, is a patent foramen ovale or a patent ductus arteriosus, without any other associated defects (simple transposition). A patent ductus arteriosus (PDA) is present in 2/3 of the patients with d-TGA, and a ventricular septum defect is present in 1/3 of the patients. Another abnormality that may be present in up to 25% of patients with d-TGA is a left ventricular outflow tract obstruction in the form of pulmonary or subpulmonary stenosis. In d-TGA deoxygenated blood returning from the tissues and passing through the right heart chambers, enters the aorta together with a quantity of oxygenated blood that has returned from the pulmonary veins and passes through a communication. The portion of deoxygenated venous blood in the aorta is large, resulting in a low oxygen saturation of the arterial blood with cyanosis and reduced tissue oxygenation, which leads to an increase in anaerobic glycolysis. This results in metabolic acidosis. Hypoxia and metabolic acidosis have detrimental effects on myocardial function and in association with volume overload of the right ventricle, which plays the role of the systemic ventricle, they cause congestive heart failure in the first weeks of life. Dextro-transposition of the great arteries (d-TGA) is the second most common cyanotic congenital heart disease. Severe cyanosis usually occurs within hours of birth. The most remarkable finding in physical examination is generalized cyanosis. On auscultation of the heart, the second heart sound (S2) is single (because its pulmonary component is inaudible, due to the posterior location of the pulmonary valve). S2 apart from being single, is also loud, due to the anterior location of the aorta. Heart murmurs may be absent unless there are associated anomalies, such as pulmonic stenosis. Symptoms and signs of heart failure such as tachypnea, dyspnea, tachycardia, diaphoresis (sweating), inability to gain weight may develop in the first weeks of life. In the presence of a large VSD cyanosis can be relatively mild and congestive heart failure dominates the clinical picture in the first weeks of life. In general, early surgical correction of d-TGA during infancy is required because otherwise many patients develop progressive cyanosis and acidosis leading to death, while others develop pulmonary arterial hypertension (PAH), a complication that often appears very early in d-TGA patients. Cyanosis in a neonate should be treated as an emergency. The diagnostic modality of choice is echocardiography. The parasternal long axis view characteristically demonstrates a parallel course of the proximal segments of the aorta and the pulmonary artery. By small changes in the position and angulation of the transducer, if one can follow the course of the vessel arising from the left ventricle and demonstrate its bifurcation then it is identified as a pulmonary artery. The parasternal short axis view at the base of the heart shows both arteries in short axis as two circular structures with the aorta usually having an anterior position. (This is strikingly different from the normal appearance of this short axis view, which shows the aorta as a circular structure and the pulmonary artery viewed along its long axis with a "sausage appearance"). The main diagnostic feature in both images is the parallel course of the two great arteries. In the top image (A) which is a short axis at the base of the heart both arteries are shown in short axis and have the appearance of two circular structures. This is strikingly different from the expected normal appearance of this short axis view, which would demontrate the aorta as a circular structure and the pulmonary artery viewed along its long axis with a "sausage-like" appearance. In the botom image (B) which is a parasternal long axis, two ventricles are seen separated by the interventricular septum and the two great arteries, each originating from a ventricle, are shown in long axis. The proximal segments of the great arteries have an abnormal parallel course, which never occurs in a normal heart. These findings in a cyanotic infant suggest the diagnosis of complete transposition of the great arteries (d-TGA), which is characterized by a parallel course of the great arteries with aorta anterior to the pulmonary artery. D-TGA is a cyanotic congenital heart disease (the second most common cyanotic congenital heart anomaly), therefore it explains why this infant is cyanotic. In d-TGA the ventricles have their normal posιtion with the anatomic left ventricle located posterior and to the left and the anatomic right ventricle anterior, but the aorta originates from the right ventricle and the pulmonary artery from the left ventricle (transposed great arteries). With these thoughts in mind, we can now name the structures: In the top image (A) 1 is the aorta (having an anterior position, as it usually occurs in d-TGA) and 2 the pulmonary artery. The treatment of choice for d-TGA is the arterial switch operation because it offers a complete surgical correction of the anomaly (see below). Till the neonate is transferred to the suitable center for surgical correction of the anomaly an intravenous prostaglandin E1 (PGE1) infusion (0.01 - 0.1 mcg/kg/min should be started to keep the ductus arteriosus patent, except in cases where the atrial communication is adequate and arterial oxygen saturation is only mildly decreased. PGE1infusion by opening and maintaining patency of the ductus arteriosus increases pulmonary blood flow, which may increase the return of oxygenated blood to the left atrium and promote left-to-right atrial shunting of oxygenated blood. This oxygenated blood will enter the right heart chambers and from there it will flow into the aorta leading to improved systemic oxygenation. However, the use of PGE1 requires caution and close patient monitoring, because it can reduce systemic blood flow. Caution is also required in cases where the patent foramen ovale has a small opening. In some patients with a small patent foramen ovale PGE1 may have the opposite effect if the increased blood return to the left atrium closes the flap of the foramen ovale. Severely hypoxemic neonates who do not respond promptly to PGE1 or who have a very small and restrictive foramen ovale can be managed with the Rashkind procedure which can improve arterial oxygen saturation. This procedure involves cardiac catheterization and balloon atrial septostomy which increases the interatrial communication through the patent foramen ovale and hence the flow of oxygenated blood from the left atrium to the right atrium. This oxygenated blood will enter the right ventricle and the aorta, which in d-TGA arises from the right ventricle. Neoaortic regurgitation (regurgitation of the patient's original pulmonary valve which after the operation has the role of an aortic valve). If it is significant, valve replacement will be required. Although the arterial switch is the procedure of choice there are still some adult patients who have undergone in infancy an atrial switch procedure. Moreover, an atrial switch procedure is still used in the rare cases where the arterial switch is very difficult or not feasible to perform due to anatomical reasons (when coronary artery translocation is not feasible, e.g. in case of an intramural coronary artery). There are two atrial switch procedures, the Mustard and the Senning operation. The Mustard procedure was originally described in 1964. Both atrial switch operations involve redirecting the systemic and pulmonary venous returns by means of a baffle made of Dacron or pericardium (Mustard operation) or atrial septal flaps (Senning operation). This will direct the systemic venous return through the mitral valve to the left ventricle, so that it will enter the pulmonary artery (since the pulmonary artery in d-TGA originates from the left ventricle). The pulmonary venous return will be directed through the tricuspid valve to the right ventricle. From there,it will enter to the aorta, since the aorta arises from the right ventricle in d-TGA. In the Mustard procedure, the use of a pericardial baffle (instead of Dacron baffle) is preferred. The patients need close follow up. Tricuspid valve regurgitation (this is the atrioventricular valve of the systemic circulation). If significant regurgitation is present, valve replacement or repair will be necessary. Failure of the systemic ventricle (the right ventricle which must support the systemic circulation). This may be treated with a two stage-arterial switch operation. In type II there is a d-transposition of the great arteries . In type III, the great arteries are l-transposed. Desaturated venous blood returning via the systemic veins to the right atrium, due to the absence of any continuity between the right atrium and right ventricle, can exit only by an intra-atrial communication. This results in a right-to-left shunt at the level of the atria. (For a right to left shunt in the atrial level to occur, the right atrial pressure must be elevated over the left atrial pressure. The elevated right atrial pressure is the cause of the right atrial dilatation). Thus, due to the obligatory interatrial shunt, the systemic and coronary venous blood mixes with the pulmonary venous return in the left atrium, leading to a diminished saturation of the left atrial blood and hence to cyanosis. The mixed left atrial blood flows through the mitral valve into the left ventricle. In the most usual type of tricuspid atresia, from the left ventricle, blood flows to the aorta and the systemic circulation and also through the VSD to the small (hypoplastic) right ventricle and from there to the pulmonary artery. An important anatomic factor, further determining the pathophysiology of tricuspid atresia is the presence or absence of accompanying pulmonary arterial pathology. In the absence of pulmonary stenosis, the volume of blood to the lungs may be normal and this normal blood oxygenation results in milder cyanosis. In contrast, when pulmonary artery or valve stenosis is also present, this leads to a reduced pulmonary blood flow, resulting in increased cyanosis. Tricuspid atresia is usually diagnosed in infancy. Patients present with cyanosis, congestive heart failure, and growth retardation (due to inadequate feeding because of dyspnea, pauses during feeding and/or anorexia). Dyspnea is a common manifestation and in an infant, it may manifest with tachypnea and/or by nasal flaring or intercostal muscle retractions. Cardiac auscultation reveals a single second heart sound (S2) and usually the murmur due to the VSD, which is a 2-3/6 pansystolic murmur at the lower left sternal border. Hepatomegaly caused by congestion of the liver may be present if there is an interatrial communication of inadequate size, (resulting in elevated right atrial and central venous pressure), or if there is congestive heart failure. The ECG in tricuspid atresia usually will demonstrate left ventricular hypertrophy, left QRS axis and signs of right atrial enlargement or of biatrial enlargement. In the chest X-ray usually the cardiac silhouette will be normal or slightly enlarged. The reason for this is that although there is an enlarged left ventricle and right atrium, there is also a small-hypoplastic-right ventricle. The pulmonary vascularity in most patients is decreased and occasionally due to an underdeveloped pulmonary artery, there is a concave pulmonary artery segment resulting in a boot-shaped cardiac silhouette, which is similar to the radiographic findings of TOF. It can be increased in some patients with accompanying TGA because then the pulmonary artery arises for the left ventricle. Echocardiography is the diagnostic test of choice because it reveals the absence of the tricuspid valve and its orifice, a right ventricle of a small size and an enlarged right atrium and left ventricle. At the site where the tricuspid valve should be, usually a dense band of echoes is seen and the anterior leaflet of the single detectable atrioventricular valve (mitral valve) is attached to the left side of the atrial septum. An interatrial communication is also seen. The size of the interatrial communication and the size of the VSD should be assessed, as well as the presence or absence of pulmonary stenosis and the relationship of the great arteries. The great arteries can be identified as the pulmonary artery or the aorta by tilting the transducer to follow the great vessel until the bifurcation of the pulmonary artery or arch of the aorta is visible. This will help decide if each of the great arteries is related to the appropriate ventricle or if there is associated transposition of the great arteries (TGA). The most effective treatment for tricuspid atresia is the Fontan operation. 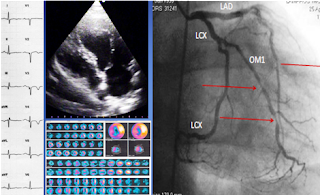 Thus, the main goal of management is to achieve a successful Fontan operation. A problem is that the Fontan operation is not tolerated well in early infancy, therefore it is best to perform this intervention at about the age of 2 years if the clinical condition of the child permits this delay. Thus, the surgical treatment of patients with tricuspid atresia typically consists of palliative procedures performed in three stages. The first stage of surgery is performed in the neonatal period and it depends on the anatomical variants. When there is a reduced pulmonary blood flow (which is the most usual problem) the initial operation is a modified Blalock-Taussig shunt (a shunt created between the innominate artery and the central pulmonary artery). This will increase pulmonary blood flow. In the rare cases with an increased pulmonary blood flow, a pulmonary band may be placed to reduce pulmonary blood flow, protecting the pulmonary circulation from the effects of elevated pressure. In cases of tricuspid atresia with transposition of the great arteries, subaortic obstruction and a restrictive (small) VSD another type of initial palliative surgery will be needed, such as the creation of a shunt between the main pulmonary artery and the ascending aorta. The second palliative surgical procedure for tricuspid atresia without TGA but also for tricuspid atresia with TGA is a Glenn shunt (cavopulmonary anastomosis) performed at the age of 3-6 months. The Glenn procedure involves removing the original shunt and creating a shunt from the superior vena cava (SVC) to the pulmonary artery, with the goal to establish passive flow from the superior vena cava to the pulmonary artery. This measure will increase pulmonary blood flow and hence blood oxygenation. The third stage consists of a final palliative surgery, the Fontan procedure or one of its modifications. This involves the creation of a connection between the right atrium and the pulmonary artery. With this procedure, the two circulations (pulmonary and systemic) are finally fully separated, with the deoxygenated systemic venous blood entering the right atrium and then passing through the shunt to the pulmonary artery. The oxygenated blood returning to the left atrium passes through the mitral valve to the left ventricle (which in these patients, is the only ventricle providing the pumping force to the circulation) and then to the systemic circulation. The Fontan procedure usually is performed at 2-3 years of age. In general, the Fontan operation is performed not only for the treatment of patients with tricuspid atresia but also for other congenital malformations with univentricular circulation, such as the hypoplastic left heart syndrome, pulmonary atresia with an intact ventricular septum, and double inlet left ventricle. The goal of the Fontan operation is to divert systemic venous blood to the pulmonary circulation in patients with a single effective ventricle. Long-term complications associated with the Fontan procedure include dilatation of the right atrium, persistent atrial arrhythmias (refractory to treatment), congestive heart failure as a result of the failure of the single functioning ventricle (the left ventricle) and protein-losing enteropathy. This is a rare congenital cardiac anomaly, in which the aorta, the coronary arteries, and the pulmonary artery arise from a common arterial trunk (the truncus arteriosus). This single arterial trunk is positioned above the ventricular septum and has one valve (the truncal valve). 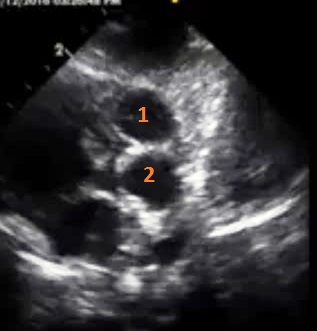 The truncal valve can be bicuspid, tricuspid or quadricuspid (i.e., it may have 2, 3, or 4 cusps) and it is often incompetent (with regurgitation) but occasionally it can be stenotic. A large perimembranous ventricular septal defect (VSD) is present below the single arterial trunk. Patients with truncus arteriosus commonly have anomalies of the aortic arch, such as a right, an interrupted or a hypoplastic aortic arch (with or without coarctation). In patients with interrupted or hypoplastic aortic arch, a patent ductus arteriosus is very important and necessary, because it provides blood flow to the descending aorta and relieves heart failure. The truncus arteriosus also leads to heart failure because of the large left to right shunt (with a mechanism similar to the left ventricular failure due to a large VSD, caused by volume overload of the left ventricle resulting from the increased pulmonary venous return of blood). At birth, pulmonary vascular resistance (PVR) is high, therefore the left to right shunt is relatively small in the newborn. However, the shunt and pulmonary arterial flow increase in the next weeks, as PVR falls. In truncus arteriosus the single arterial trunk receives blood from both ventricles, therefore it receives mixed oxygenated and deoxygenated blood. This mixing of blood results in cyanosis. Patients present in the neonatal period with progressive cyanosis. Cyanosis often is present immediately after birth. Congestive heart failure (with poor feeding, diaphoresis, and tachypnea) usually develops days to weeks after birth. Sudden shock may develop if the ductus arteriosus closes. Adults with unrepaired truncus arteriosus develop Eisenmenger syndrome. The ECG is not very helpful in the diagnosis of this condition. It usually shows biventricular hypertrophy. The chest radiograph shows an enlarged cardiac silhouette, increased pulmonary vascular markings and it may also show fullness in the region of the truncal root. The best diagnostic investigation is with echocardiography, by demonstrating a single overriding great artery. Parasternal long-axis and subcostal coronal (long axis) views demonstrate the single arterial trunk arising from the ventricles. The arterial trunk overrides the ventricular septum. The suprasternal and the high parasternal views demonstrate the aortic arch and the anatomy of the central pulmonary arteries. Treatment is initially with medical stabilization of congestive heart failure, with diuretics, ACE-inhibitors and digoxin. If there is an interruption of the aortic arch or coarctation, PGE1 (intravenous infusion) is administered, to keep the ductus arteriosus patent. In patients with truncus arteriosus, corrective surgery must be performed as soon as possible (in the neonatal period, i.e in the first 30 days of life). Surgical treatment involves the excision of the pulmonary arteries from the common arterial trunk. The pulmonary arteries are connected to a prosthetic conduit which contains a valve or to an aortic homograft with a valve. The conduit or the homograft is connected to the right ventricle and to the pulmonary arteries. The ventricular septal defect is closed leaving the aorta arising from the left ventricle. In cases with significant regurgitation of the truncal valve, which will have the role of the aortic valve, the valve is repaired or replaced with a prosthetic valve. Regurgitation through the conduit which has been placed between the right ventricle and the pulmonary arteries or obstruction of the conduit, or the need to replace it because, as the patient grows, it will become small for the circulatory needs. In patients with associated interrupted aortic arch, there is a risk of recurrent arch stenosis, after surgical correction. TAPVC is a cyanotic congenital heart disease characterized by the return of all four pulmonary veins directly or indirectly to the right atrium and not to the left atrium. In other words, all the pulmonary veins drain into the systemic venous circulation. There are anatomic variants depending on the site of the anomalous connection of the pulmonary veins. In the supracardiac type, all the pulmonary veins return to a common pulmonary vein behind the left atrium. The common pulmonary vein usually courses upward in front of the pulmonary artery, and it drains into the left innominate vein. Rarely this pulmonary venous confluent chamber or common pulmonary vein drains to the superior vena cava or to the azygos vein. In the cardiac type of TAPVC the pulmonary veins drain to the posterior aspect of the coronary sinus or directly to the right atrium. In the infracardiac type of TAPVC the pulmonary veins connect to a common vertical vein which has an inferior course and ususally passes through the esophageal hiatus of the diaphragm and drains to the portal vein or the hepatic vein. Another site where this common vertical vein may drain, is the inferior vena cava below or above the diaphragm. In the mixed type of TAPVC any combination of pulmonary venous connections at two or more different sites of the systemic venous system may be present. In the mixed type most commonly three pulmonary veins connect to form a common pulmonary venous confluence while the fourth drains separately. A consequence of the anomalous drainage of the entire pulmonary venous return into the systemic venous system is the mixing of the oxygenated pulmonary venous blood with the deoxygenated systemic venous blood. A portion of this mixed blood enters the systemic circulation usually through a shunt at the atrial level and from the left heart chambers, this mixed oxygenated and deoxygenated blood will pass to the aorta, resulting in cyanosis. Because the right atrium receives an increased volume of blood (both the systemic and the pulmonary venous return) another feature of TAPVC is a dilated right atrium and right ventricle. total anomalous pulmonary venous connection (TAPVC) is influenced by the degree of obstruction to the pulmonary venous flow. The obstruction can be caused by compression of the pulmonary veins by neighboring structures. Other causes of obstruction are tortuous or stenotic pulmonary veins or common pulmonary veins. An obstruction to pulmonary venous flow causes a significantly elevated pulmonary venous pressure. This elevated pressure is transmitted backward to the pulmonary vasculature resulting in pulmonary edema (interstitial or alveolar) and pulmonary hypertension. Neonates with significant obstruction of the pulmonary venous return present with respiratory distress, tachypnea, marked cyanosis and they often develop pulmonary edema. Cardiac auscultation usually reveals a single, loud second heart sound (S2) and no murmur. Hepatomegaly can be present because of venous congestion. When there is no obstruction of the pulmonary venous flow there is an increased flow in the pulmonary arterial circulation (because the right atrium and right ventricle receive an increased amount of blood). Thus, these patients without surgical correction will develop pulmonary hypertension and progressive obstructive changes of the pulmonary vasculature due to the pulmonary overcirculation.This can lead to pulmonary arterial hypertension and right ventricular hypertrophy or failure. Patients with severe obstruction of the pulmonary venous flow have an earlier and much more severe clinical presentation than patients without significant obstruction. The infradiaphragmatic type of TAPVC is always associated with severe obstruction of pulmonary venous return, leading to pulmonary edema and cyanosis unresponsive to supplemental oxygen. The other two types (supracardiac and cardiac) usually do not involve significant obstruction and lead to mild or moderate cyanosis and may also demonstrate mild signs of heart failure in the first month of life. Generally in infants without significant pulmonary venous obstruction physical examination, apart from variable degrees of cyanosis, also detects signs that are similar to those of an atrial septal defect. 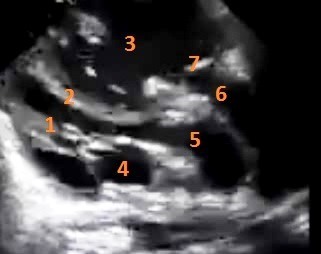 Such signs are caused by the volume overload of the right heart chambers and usually include a widely split S2, occasionally with a loud pulmonary component, a grade 2 -3/ 6 systolic ejection murmur audible along the upper to mid-left sternal border (due to the increased flow through the pulmonary valve)). Also due to increased transvalvular flow in the right heart, a mid-diastolic tricuspid flow murmur at the lower left sternal border may be audible. The ECG in TAPVC shows right axis deviation, right ventricular hypertrophy, and in some cases also right atrial enlargement. 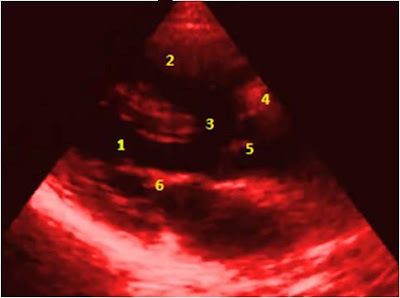 In echocardiography, the right atrium and the right ventricle are dilated in all types of total anomalous venous connection (TAPVC or TAPVR) and there is an inability to demonstrate the expected normal connections of the pulmonary veins to the left atrium (this should raise the examiner's suspicion of this diagnosis). Color Doppler will demonstrate a right to left shunt through the atrial septum. Moreover depending on the type of TAPVC a common collecting vein or venous confluence can be seen near the left atrium, a dilated superior vena cava or a dilated inferior vena cava, due to the increased flow (this depends on the site of the anomalous pulmonary venous connection), or the pulmonary venous connection to the coronary sinus or to the right atrium may be visible. Surgical correction at the time that the diagnosis is made and the patient has been stabilized is required in all cases of TAPVC regardless of the degree of obstruction. TAPVC without surgical treatment generally has a poor prognosis. Surgical repair involves creating a wide connection between the pulmonary venous confluence and the posterior wall of the left atrium. The surgical technique for repair of cases with pulmonary venous return to the coronary sinus is different. Then the coronary sinus is unroofed into the left atrium so that it drains to the left atrium and its opening to the right atrium is closed. Rao PS. Diagnosis and management of cyanotic congenital heart disease: Part I.
Blonshine SK. Transposition of the Great Arteries. The Jatene procedure. Surgery of Cyanotic CHDs - CRASH! Medical Review Series Paul Bolin, M.D. Georgios N Chatziathanasiou. Simple theme. Powered by Blogger.